I have met winemaker Renzo Cotarella a number of times at Vinitaly, the annual wine fair in Verona and at ITrulli restaurant where I was the wine director. Renzo has always been eager to talk about wine and answer all my questions. Thanks to him I am able to recognize a “corked” wine and explain why it is corked even when it is not obvious. I was eager to attend a class he was teaching at Eataly. When Renzo walked into the room and saw me, he came over and said “Charles, we have to speak about Fiorano.” www.charlesscicolone.wordpress.com/2010/07/06/fiorano-rosso-the-noblest-roman-of-them-all. The class was beginning so we could not speak until later, but that conversation will have to wait for another blog. 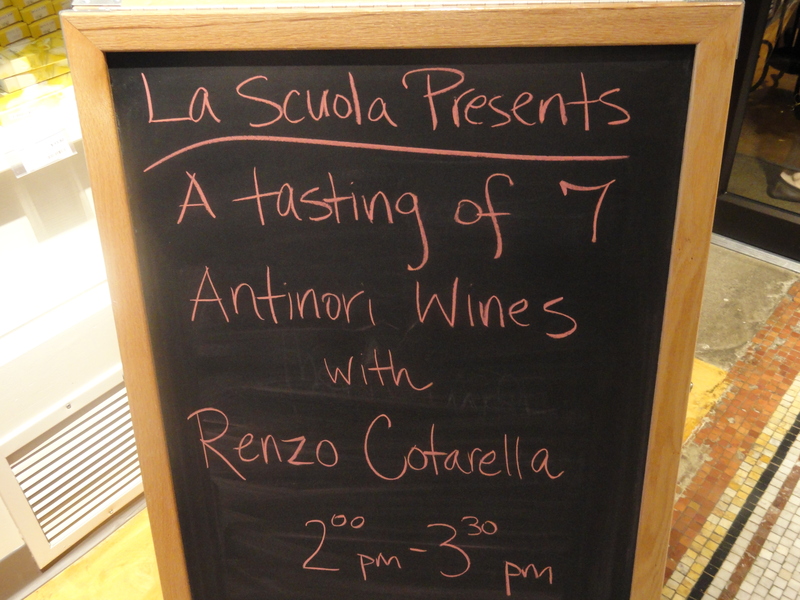 Renzo began by talking about his years in the wine business and the history and wines of Antinori. Many years ago Renzo tasted older Chardonnays with Darrell Corti from California (owner of Corti Brothers Fine Wine and Gourmet Foods Italian Grocery Store) and was surprised how well the wines had aged. When he became the winemaker for Antinori he wanted to make a white wine that would age but did not want to make just another Chardonnay. He turned to the local Umbrian grape Grechetto that would add acidity and minerality to the Chardonnay and make it more interesting. The wine he produced was Cervaro Della Sala and the way he spoke about this wine showed that he was very excited about what he had produced. His said that the blend changes according to the vintage, the hotter the year the more Grechetto is in the blend. The Grechetto is added at the last minute after he sees how the Chardonnay is developing. Grechetto may be anywhere between 5% to 20% of the blend. Renzo said the first real vintage was 1986 and the wine is still drinking and has good acidity and minerality. Cervaro Della Sala Umbria IGT 2006 Made from 85% Chardonnay and 15% Grechetto depending on the vintage. The grapes come from 15 to 20 year old vines planted at Antinori’s Castello della Sala Estate at elevations ranging between 650 and 1.300 feet in pliocene sedimentary soils rich in marine deposits with some clay. Renzo said that in 2006, all of the grapes showed a good level of sugar, balanced acidity and polyphenolic components. The grapes are hand harvested and placed in a special refrigerated conveyer until they are ready to be pressed. The Chardonnay and Grechetto are vinified separately and the must remains on the skins for 8 to 12 hours. Renzo said that this was done to maximize the wine’s aromas. The must is then placed in French barriques –Alliers and Troncais – where alcoholic fermentation takes place over a period of 14 days. The wine stays on the lees in barriques for 6 months while malolatic fermentation is completed. The wine is then racked, blended and bottled and is released after ten months. Cervaro Della Sala Umbria IGT 2008. The wine was vinified the same way as the 2006, however there was a big difference in the style and taste of the wines. Renzo said that it was very hot at the end of August 2006 and the grapes were over ripe and therefore the 2006 is rounder, bigger and riper then the 2008. Also, Chardonnay ripens before the other varietals and this can be a problem. When he is asked how a vintage will turn out Renzo said that it all depends on the weather in the last month. 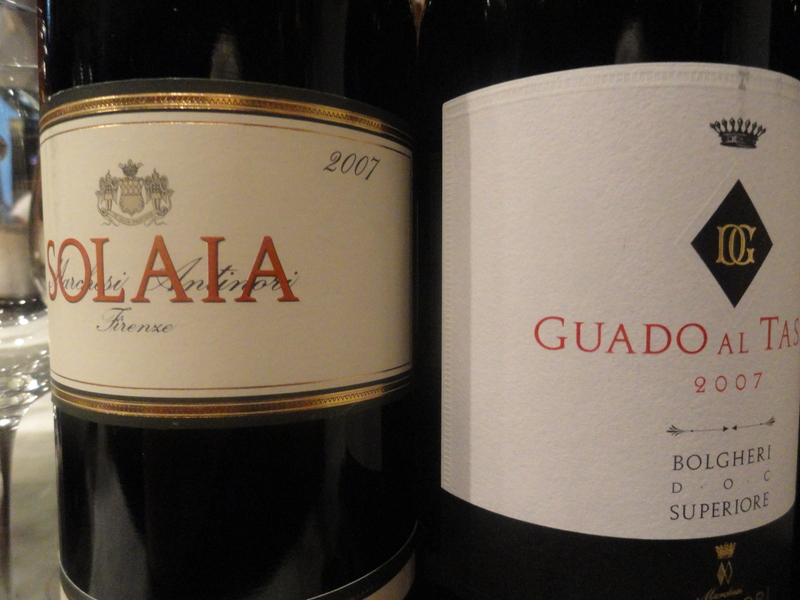 Weather-wise 2008 was a better year and the wine has better acidity and minerality. He preferred the 2008 but the weather was not the only difference. Renzo said, and this really got my attention, that they are now using less oak (barriques). He wants more bright fruit in the wine and which should reflect the terroir in which the grapes are grown. The 2008 was aged in barriques, 50% new and 50% one year old. I really enjoyed the 2008. The 2009 and the 2010 will have 3 months less of oak aging. Renzo called this a unique wine and said that men liked the wine but women really loved it. Tignanello Toscana IGT 2004 made from 85 % Sangiovese, 10% Cabernet and 5% Cabernet Franc. This has been the blend since the 1982 vintage. The harvest was later than in the previous year 2003 which was very hot. The grapes come from the Tignanello vineyard, a 116 acre site at Antinori’s Tignanello estate. The vineyards face southwest with calcareous rocky-marl and limestone soils and albarese rock. There is a long maceration with frequent delestage, after fermentation, the wine was placed in new French oak barriques where malolatic fermentation was competed by the end of the year. After malolatic the wines were blended and left in barriques for 12 months in order to mature. Renzo said that the wine was tasted one barrique at time to make the final selection before bottling. The wine is aged one year in bottle before release. Tignanello was first released as a single-vineyard Chianti Classico in 1970. 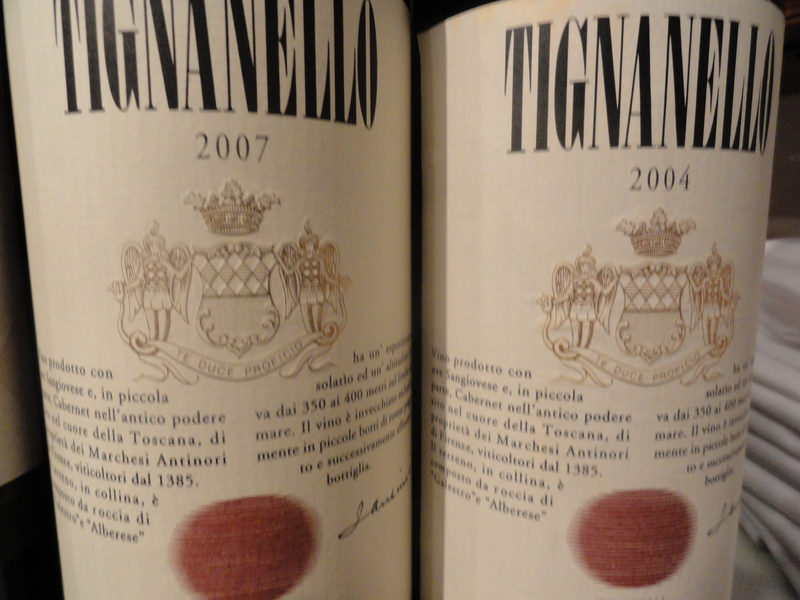 Renzo said that Tignanello was the first Sangiovese to be aged in barriques, to use nontraditional grapes and leave white grapes out of the blend. Therefore it was the first Super Tuscan. Tignanello is only produced in the best vintages and there was none produced in 1972, 1973, 1974, 1976, 1984, 1992 and 2002. He really caught my attention once again when he said that 2004 was a very good vintage but the grapes were very ripe. In fact he said that the wine was too big and too concentrated and he wanted to get away from this style of wine! Tignanello Toscana IGT 2007. Made from 80% Sangiovese, 15% Cabernet Sauvignon and 5% Cabernet Franc. This wine was made the same way as the 2004, or was it? 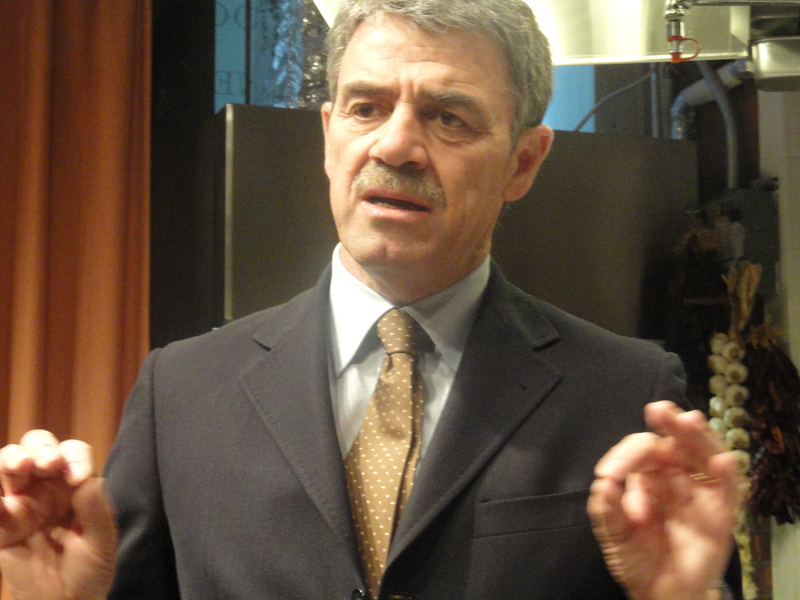 Renzo began by saying that 2007 was an excellent vintage in Tuscany. I thought that the difference between the two wines was like night and day. 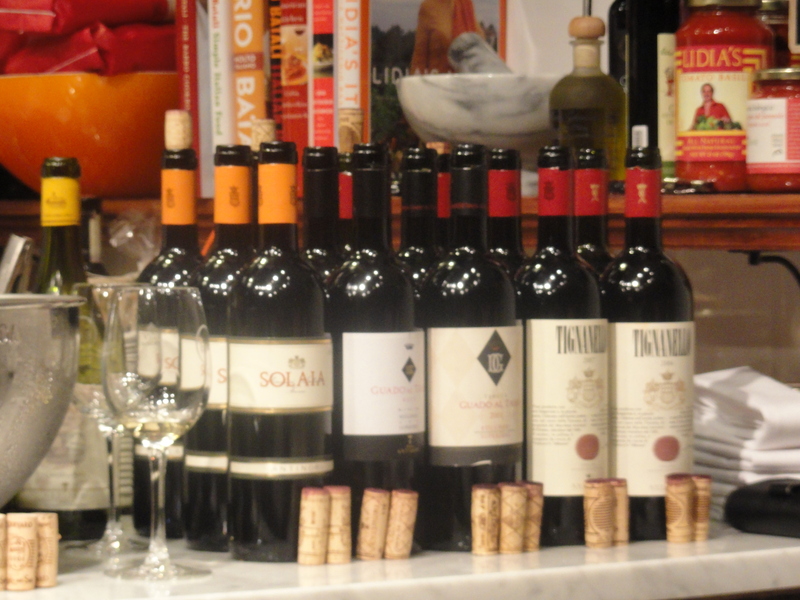 The 2004 was much darker in color, bigger, more concentrated and lacking in acidity. The 2007 was a very well balanced wine, with good structure, soft tannins, good minerality, acidity, and bright fruit, In short, a wine that tasted like the place that it came from and would go very well with food. This is my type of wine and now I hope it is also Renzo’s. He said that since 2004 they were moving away from these heavy, oaked red wines and moving toward more fruit and less wood in the wines. Where the wine comes from is very important and the wine should reflect this. The first bottle of Tignanello that I tasted was from the 1975 vintage. I really liked the wine as well as the other vintages produced in the 1970’s. It seems to me that with the 2007 they are beginning to move back toward the wines of the 1970’s! One can only hope! Renzo said that they have in the vineyard what they call a “Master Selection”. These are the same clones that they had in past and still use today. They did not replant with the “new’ clones of Sangiovese recommended by the Sangiovese Project 2000. Guado Al Tasso Bolgheri DOC 2001 made from 60% Cabernet Sauvignon, 30% Merlot, 10% Syrah other red grape varieties. The Merlot was harvested at the beginning of September and the Cabernet from the middle to the end of September. After destemming and light crushing, the Merlot and Cabernet Sauvignon are vinified separately. Maceration is in stainless steel tanks over a period of 15 to 20 days, during which time alcoholic fermentation is also completed. The wine was transferred to French barriques of Troncais and Alliers where malolatic fermentation was completed by the end of the year. The wine was then racked, blended and returned to the barrels for about 14 months aging. It was aged in bottle for about one year before release. 2001 was a very good vintage in Bolgheri but I found that this was big wine, over extracted, ripe fruit and a wine that was too modern for my taste. Guado Al Tasso Bolgheri 2007 Renzo said that they no longer use Syrah and have gone to a more Bordeaux style blend; Cabernet Sauvignon 57%, 30% Merlot, 10% Cabernet Franc and 3% Petit Verdot. Ideal dry conditions in September with warm days and cool nights allowed the grapes to ripen perfectly delivering exceptional high quality fruit. After 18 months of aging in new barriques the best lots were blended. The wine was then bottled and aged for 10 more months before release. As Renzo kept on saying, 2007 was an exceptional vintage in Tuscany. But it was not only the vintage that made the wine better. The demise of the Syrah was a factor as well as Renzo’s new approach to wine making. It is still a big wine but is well balanced with hints of black fruit and a very nice finish and aftertaste. Renzo said that Tenuta Guado al Tasso is located near the medieval village of Bolgheri in the area known as the Maremma and said that this area is very different from other parts of Tuscany. It is closer to the sea, it is warmer and there are breezes from the sea and from the land which help to moderate the climate. The soil is rich and there are fewer rocks and the elevation is good. He feels that wines from this area have “velvet tannins” and age very well. Sangiovese does not do as well here as the grapes used to make Bordeaux. The growing season is long and if you are not careful the grapes can become overripe and over-extracted. He does not like big dense wines and therefore picks the grapes before this happens. The wine was first produced in 1990 and is not made in every vintage. Solaia Toscana IGT 2007 75% Cabernet Sauvignon, 20% Sangiovese and 5% Cabernet Franc. The optimal climate conditions in mid-September and the first week of October allowed for a slightly early harvest with a careful, unhurried selection of grapes. The grapes come from a 25 acre southwest-facing vineyard that is 1,150 to 1,330 feet above sea level on stony, calcareous soil of marl and friable alberese rock. It is contiguous to the Tignanello vineyard in Chianti. The grapes were harvested by hand. The extraction process was carried out with alternating pumpovers with delestage according to the requirements of the three grape varieties. After alcoholic fermentation, the wines were racked into new oak barrels to undergo malolatic fermentation. The wines are aged in new French oak for about 18 months. After oak aging the wine was selected, blended and aged for one more year in bottle. This single vineyard wine was first produced in 1978 and was a blend of Cabernet Sauvignon and Merlot. Later 20% of Sangiovese was added to the blend according to the vintage. Solaia is only produced in exceptional vintages. I was surprised by this wine. It was more fruit driven then in the past with aromas of cherries and blackberriesand the oak was there but it was not excessive.